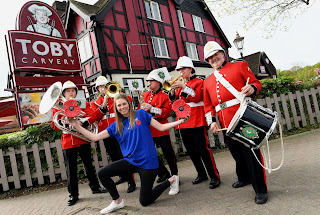 Toby Carvery is delighted to announce its charity partnership with The Royal British Legion, which it will be supporting with fundraising initiatives over the next two years. Toby Carvery’s across the UK will be taking part in the fundraising initiative, adding a special charity pudding to their menus with 25p from each pudding sale being donated to The Legion. The jam and coconut sponge was voted for by Toby Carvery’s fans on Facebook to be the official charity pudding and received over 500 entries. Toby Carvery aims to raise £100,000 for The Royal British Legion by the end of 2018, and is encouraging everyone to tuck into a pudding and get involved in local fundraising activities to help support this great cause. The money raised will be used to support active, and veteran members of the Armed Forces and their families, remembering those fallen in the line of duty and ensuring their memory lives on, and that those left behind are fully supported within their community. As well as fundraising initiatives, Toby Carvery is giving back to Armed Forces and their families by partnering with the Defences Discount Card which gives Armed Forces members, spouses and veterans 10% off their food bill. As the official discount service for the Armed Forces, the Defence Community and Veterans, the card is also available to members of the community not previously supported, including spouses and partners of serving personnel. Over 100,000 cards are currently in circulation across the UK since the launch, and this number is continuing to grow on a monthly basis.